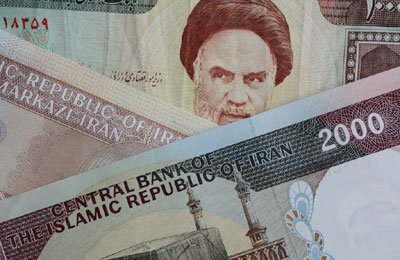 Iran will defeat a "conspiracy" against its foreign currency and gold markets, an adviser to supreme leader Ayatollah Ali Khamenei said, as pressure mounts on authorities to deal with the rapid collapse of the rial. Riot police fought demonstrators and arrested money changers in and around the Tehran bazaar on Wednesday during protests triggered by the fall of the Iranian currency, which has lost a third of its value against the dollar over the last ten days. Protesters called President Mahmoud Ahmadinejad a traitor because of what many say is his serious mismanagement of the economy, which has also been badly hit by US-led Western sanctions imposed over Iran's nuclear programme. But there has so far been no public criticism of Khamenei, the Islamic Republic's most powerful authority. "Iran is overcoming the psychological war and conspiracy that the enemy has brought to the currency and gold market and this war is constantly fluctuating," Gholam Ali Haddad Adel, a close ally of Khamenei, Fars news agency reported him as saying. "The arrogant powers, in their crude way, think that the nation of Iran is ready to let go of the Islamic revolution through economic pressure but we are establishing Iran's economic strength," he said. The fall in the rial over the past year has been caused by economic mismanagement and sanctions, a U.S. official said. Iran could relieve the pressure if it resolves concerns about its nuclear work, David Cohen, undersecretary for terrorism and financial intelligence at the U.S. Treasury, said in London. "The Iranian leadership has within its capacity the ability to relieve the pressure its people are feeling," he said. Ayatollah Ahmad Khatami, a hardline cleric, called on the various branches of government to work together to solve the country's economic problems. "It is expected that the authorities solve the problems with empathy. Treating the pain will solve the problem, not apportioning blame," he said in a sermon at Friday prayers. Most of the bazaar was shut on Thursday, but business associations said it would reopen on Saturday under the supervision of the security forces. It is traditionally closed on Fridays. Analysts say any further discontent could spread quickly if it is allowed to gain a foothold. The bazaar, whose merchants were influential in bringing an end to Iran's monarchy in 1979, wields significant influence and this week's unrest is a clear signal that the economic hardship is having a profound effect on businessmen and residents alike. "I have a good salary and I can still afford the shopping and expenses for my family," Ali, 42-year-old Iranian engineer, told Reuters by telephone. He earns $1,000 a month. "But everything has become so expensive and so difficult for people. I'm just glad I have a job." This week's plunge in the rial has had a small but noticeable impact on groceries and Ali fears more price rises are imminent. "Eggs, milk, cheese, infant formula, cooking oil, rice and beans have all increased over the last six days," Kia, a Tehran-based blogger, wrote in an email. "I've seen people buying lots of food and some of them are stockpiling," said Kia, alluding to further rises on the way. The cost of food and fuel has shot up in the last year as rampant inflation has taken hold. Iranians now pay nearly three times more for chicken and red meat than a year ago. Farmers say they are forced to pass on the increased costs of animal feed and vaccines, which are often imported and directly affected by the fluctuations in the exchange rate. The rial's losses have accelerated despite the government's attempts to stem the slide by setting up an "exchange centre" designed to supply dollars to importers of some basic goods at a special rate, slightly cheaper than the market rate. Instead of allaying fears about the availability of dollars, the centre seems to have intensified the race for hard currency. "This is a very serious situation. There is a lot of pressure on Khamenei to remove Ahmadinejad but they will need to find a way to do it without losing face," said Iranian-born Mehrdad Emami, an economics adviser to the European Union. "Ahmadinejad is pushing ahead and that could create continuing unrest which will need a lot of security on the streets," he added.